Carpet mold is nasty stuff. Mold and mildew on hard surfaces such as tile are hard to get rid of. But it is even worse, if not impossible, to mitigate mold and mildew on carpeting. Not only that, the mold is often found on the carpet backing where it is not seen until it is too late. Conventional wisdom says that moisture is the culprit for causing mold on the carpet and that ridding the carpet of moisture will take care of the mold problem. This is only partially true, however. As it turns out, carpet mold is surprisingly easy to keep under control, moisture-control being only half of the answer. Are Basements the Enemy of Carpet? The potential for moldy carpets prevents many homeowners from installing carpet in their basements. Basements are notoriously damp places, even basements that seem dry to sight, touch, and smell. Even light humidity in the trapped environment of a basement builds up over time and can cause problems. Mold is not just unsightly but can also become a health hazard for those with allergies. But you do not even need to have allergies to be affected by mold. Toxic molds have byproducts called mycotoxins that can even harm healthy individuals. As if that were not bad enough, trying to sell a mold-infested house can be difficult, or at least costly, for the seller. Scientific lab studies have shown a more complex picture of how mold grows in carpet and how best to avoid the problem. Studies were conducted to find out whether high humidity (such as you might find in a basement, below-grade installation) caused mold growth on carpeting. Carpeting in various conditions (new, old, dirty, clean) were subjected to various levels of humidity. Researchers, in particular, wanted to see if high humidity (defined as 80% or more) provided mold/mildew with an incubator in carpeting. What they found was that dirt, more than humidity, contributed to mold growth. Carpets that were heavily or even lightly soiled bred far more mold than clean carpets when subjected to the same levels of moisture. Simply put, high humidity plus dirt equals mold. It is worth noting that if the carpet is clean enough, it is virtually impervious to any mold growth despite the conditions. In the studies, clean nylon carpet was subjected to high temperatures and levels of humidity (80 degrees F; 80% humidity), and no mold growth occurred. Even clean carpeting that was known to have active mold spores did not have additional mold growth. 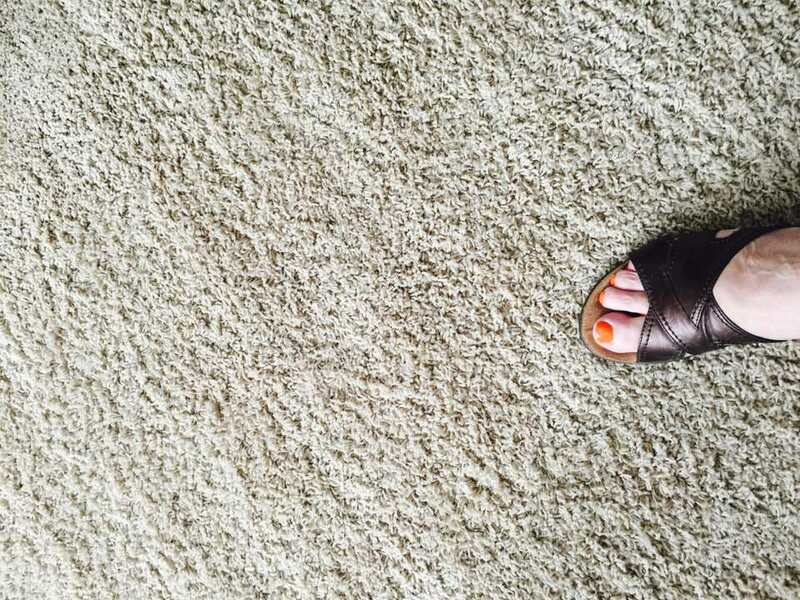 Dirt on carpeting grows mold for two reasons. First, the dirt contains mold spores. Second, dirt itself contains moisture. The moisture in the dirt combined with the room's ambient humidity therefore provides a rich breeding ground for mold. Even worse, dirt is a hygroscopic material meaning that it readily soaks up any available moisture—whether ambient humidity or surface moisture. In other words, dirt is a moisture magnet. Keep Humidity Low: 65% humidity and lower tends to be the perfect level for maintaining a mold-free carpet. Even 60% humidity is sometimes cited as the highest desirable level. If your house is not naturally low in humidity, install a portable dehumidifier. Keep Temperatures Low: Temperature can contribute to mold growth in carpet, with 80 degrees F and higher is defined as high. Effective HVAC (air conditioning) will kill two birds with one stone as it both lowers humidity and temperatures. Keep Your Carpet Clean: While there is no official definition of "clean," it is assumed that a carpet vacuumed on a weekly basis with a good-quality will clean a carpet enough to inhibit mold growth. Install Man-Made Carpet Materials: Organic carpet materials such as wool are more prone to mold growth than inorganic (human-made) carpeting such as nylon or olefin.